Since 1894 the King name has been synonymous with world-class high quality brass instruments. World renown artists, the likes of Tommy Dorsey, Ziggy Elman, Julian "Cannonball" Adderley, Charlie "The Bird" Parker, and Harry James, all trusted King as their choice of musical instrument. Built in Eastlake, Ohio, today's King 601 student trumpet draws from that heritage and is built on the same platform as the King professional trumpet made famous by the great Harry James in the 1940's and '50's. 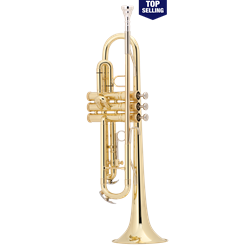 With a pedigree like no other, the King 601 trumpet offers professional level playing characteristics a student premium. FEATURES The King 601 Bb Trumpet is made in the USA using nothing but the highest quality materials. It offers a unique .459"/.462" dual bore main tuning slide with a responsive 4-7/8" seamless bell for easy projection and control. The stainless steel piston material provides smooth and quick action. The 1st valve thumb saddle makes for easy intonation adjustments. The clear lacquer finish provides a subtle warmth to the overall sound. The 601 is a well designed durable instrument perfect for the beginning student and is well suited for all types of music. TECH SPECS .459"/.462" dual bore 1st slide thumb hook Rose brass leadpipe Monel pistons Clear lacquer finish King 7C mouthpiece 7500C molded case Available in silver-plate finish as model 601SP FREE SHIPPING with your purchase today!